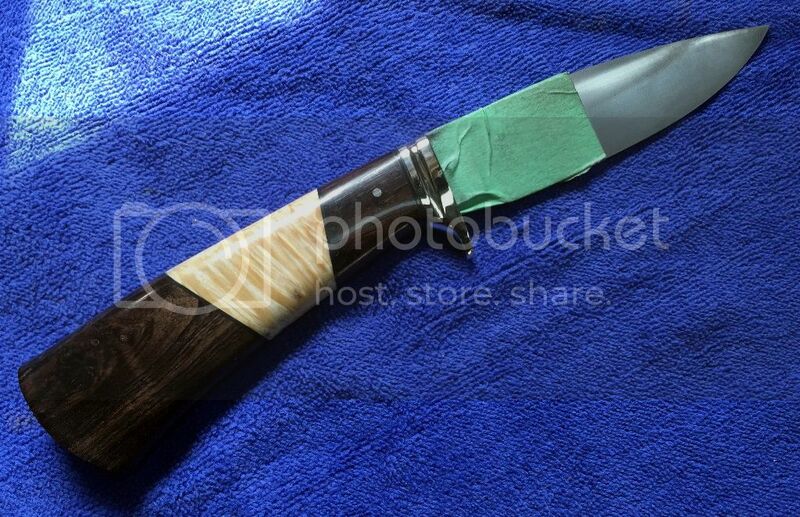 With the reline on the forge curing, I had time today to get some straight knives "glued up". All of these are 1084 and 52100 hunters. I decided to change things up a bit I would "mix-n-match" some handle materials. Still have a couple of Mosaic Bowies I'm finishing out, then the rest for Blade will be folders.... got a couple of "ideas" for some cool folders this year! Looking good Ed. Is that vaseline on the blades? WAIT A MINUTE. So, you're grinding crossguards AFTER the scales are glued on? Walt: Yep! Vaseline! I learned a long time ago that its much easier to wipe off vaseline, then to try to clean up cured acraglass from someplace it doesn't belong. Allan: These are all hidden tang knives, but yes, I finish the fronts of the guards, then "glue" everything up in rough form....then once the acraglass is cured, finish everything as a single unit, to where I want it. Makes for a much nicer "flow" overall, and makes everything much easier. I finish the fronts of the guards, then "glue" everything up in rough form....then once the acraglass is cured, finish everything as a single unit, to where I want it. Makes for a much nicer "flow" overall, and makes everything much easier. That's why they make J-Flex belts. In fact that's the main reason why I keep my old Grizzly grinder as I like the vertical configuration for handle work. Hope you have a great show. No shows for me until Kansas City. See you there. Last edited by Gary Mulkey; 04-16-2015 at 06:36 AM. I don't see pins through the handles are they getting pins afterwards or will they remain secured with epoxy? Theres really no need for pins.... the acraglass will hold pretty much forever. However, because most people "expect" pins, there will be some. I usually create the handle profile, then drill through the handle and tang, and put the pin(s) in place.....then finish the rest of the handle down.